“Life” in the fast lane. Dan Brown, F. Scott Fitzgerald, Harper Lee, Margaret Mitchell, J.D. Salinger… chances are that you’ve read a book by at least one of these writers. All of these American authors have given us classics that new generations of readers still turn to today. So, when a band comes along called American Authors, you’d hope that they would be capable of creating their own classics as well. They stand by the philosophy that, “we all have a story to tell, whether it’s audible, visual, silence or motion,” and from recorded music to photographs and the live experience of a concert, they manage to combine all four into their group. They’ve been at it for a few years now, and with a little patience, the quartet consisting of lead vocalist Zachary Barnett, lead guitarist James Shelley, bassist Dave Rublin and drummer Matt Sanchez are ready to pop. I have to love an act that originated in Boston and American Authors formed back in 2006 at the Berklee College of Music. The school’s also provided us with members of acts currently on the charts like Imagine Dragons, Karmin and Passion Pit. All four attended together at the same time, originally taking on the name The Blue Pages. They eventually moved to Brooklyn after spending a few years in Beantown. They released two albums, Anthropology (2011) and Rich With Love (2012), but decided following those that the name wasn’t working for them. 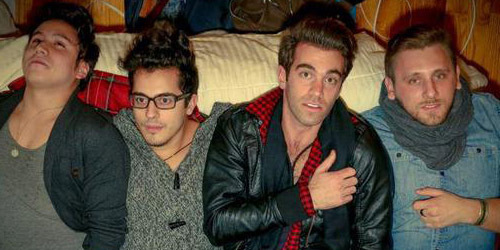 So, they got their thinking caps on and came up with American Authors, which landed them a record deal with Mercury Records/Island Def Jam in 2013. With bands like Neon Trees and Parachute on the same roster, they fit perfectly. Their first single, “Believer”, flirted with the Alternative top 50 recently, but never made it beyond #48 on any given update. That last time it showed up on there was on Monday with a decrease in spins, but it’s since been missing in action. It does appear that the support for it has been pulled since it never really got off the ground. It’s a shame, but luckily, lightning can definitely strike this time as they prepare for a multi-format smash: “Best Day Of My Life”, which will appear on a forthcoming EP by the band to be released on August 27. It goes to radio the day before at the Hot AC format. While I’m surprised it hasn’t been serviced to a few other radio formats first (AAA and Alternative), “Best” should do well enough at Hot AC. They may be an unknown band, but their song is catchy and uplifting and just makes you want to dance around. (Or, maybe just feel good.) Now, while you can dismiss it as a second-rate version of “It’s Time” by Imagine Dragons with a folky twist in the chorus, I’d like to think, at least from my standpoint, that’s a little more instant and accessible than the song that might have paved the way for it. The chorus is more simplified and it’s easier to sing along to. It just sounds like the type of song you would want to hear during either the spring or the fall; there’s something both organic and playful about how it’s arranged and how the final product came out. It’s (so far) a solid choice of release and it looks to have a bright future both on and off airwaves. The label seems to have a long-term strategy in place for the band to get a bit of exposure. Since April, “Best” has been used in an advertisement for Lowe’s. It’s also being used in a trailer (beginning at 1:27) for the movie Delivery Man, starring Vince Vaughn, Chris Pratt and Cobie Smulders. That isn’t in theaters until November 22. If it’s been easy enough to secure those placements, don’t be surprised if it ends up promoting an upcoming fall TV series (I’m looking at you, weight loss shows) in the near future. ‘Til then, the boys are playing smaller venues through the end of August, plus three additional dates in September. If these bookworms know anything, it’s about reading between the lines, and should they seize the opportunity, “Best Day Of My Life” will be their first of many best-sellers. Purchase “Best Day Of My Life” on iTunes. / Purchase “Believer” on iTunes.